Todays Railways UK is the best guide and railway information source of UK. 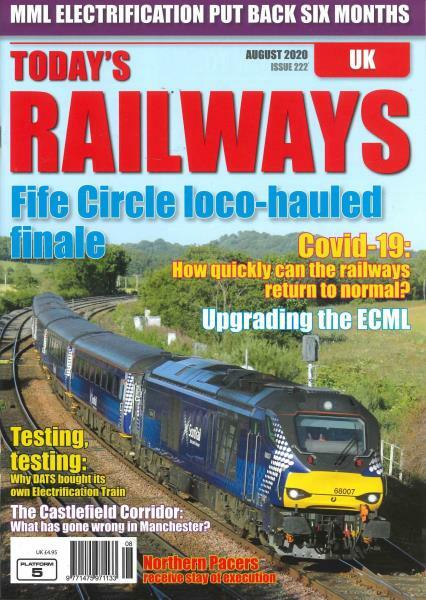 This is a monthly published magazine that covers UK railways in every which way possible. Right from recent developmental news to historical information of tracks and vintage engines, the magazine has it all. The magazine extensively covers the current news and developments related to modern trains spread all across UK. Inside the pages one can also find the exclusive coverage of the contemporary trains and heritage steam engines with breath-taking coloured pictures and well written information articles. Apart from news and articles, the magazine also has the useful information on the railways time table changes, new trains, tracks, route guides and touring. Along with the information on business and investment in railway sector, the Todays Railways UK magazine makes its place to be the leading railway editorial in the sector that is very lively with significant information and amazing pictures. The magazine is well written and published to provide you the real essence of UK railways in its full glory and beauty. Every issue is worth preserving for any train enthusiast who is not bound to any size, scale and location. I bought this magazine whilst on holiday and found it absorbing and contempory.So on return home ordered it on subscription, still finding reasonably up to date. Printed on good quality paper. I like this magazine as it keeps me right up to date with railways in the UK. Good magazine. I would be interested to get more information in adevance about rail festivals, other rail events and about railtours in GB, not just the diary. Absolute great magazine for railway "lovers", especially for me because my hobby is British railway. Wide range of informative and relevant articles.